Waorani indigenous people march toward the provincial court to demand the non-exploitation of oil in their territory with a banner reading "The forest is our life. No more oil," in Puyo, Ecuador, April 11, 2019. 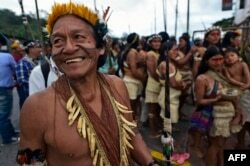 Hunter-gatherers in the Amazon sought in court on Thursday to stop Ecuador's government from auctioning their land to oil companies, as tension mounts over the future of the rainforest. "We live on these lands and we want to continue to live there in harmony. We will defend them. Our fight is that our rights are respected," said Nemonte Nenquimo, a leader of the 2,000-strong Waorani. "Our fight is not just a fight about oil. This is a fight about different ways of living — one that protects life and one that destroys life," said Nenquimo, from Pastaza province in the eastern Amazon. Ecuador's energy and environment ministries, the respondents in the case, and the nation's hydrocarbons secretary were not immediately available to comment. Waorani indigenous people march to demand the non-exploitation of oil in their territory, in Puyo, Ecuador, April 11, 2019. Indigenous people from 16 Waorani communities marched to the provincial court of Pastaza province to attend a protection action hearing against the exploitation of oil in Waorani territory. "The lawsuit is to ensure that the processes enshrined in the constitution are carried through to guarantee the Waorani rights to prior consultation and their rights to territory," said Parker, who is based in Ecuador. "The fact that the Waoroni have a chance in court to be able to plead their case is in itself a very important step," he said, adding that a court victory would provide an "invaluable precedent" for other indigenous Amazonian tribes. The government announced last year that it had divided swaths of forest up into blocs for auction, one of which — bloc 22 — covers the Waorani's ancestral lands, raising the specter of pollution and an end to their way of life. 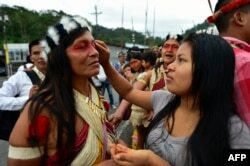 A Waorani indigenous woman gets makeup on during a demonstration against the exploitation of oil in their territory in Puyo, Ecuador, April 11, 2019. Hundreds of Waorani and other indigenous peoples arrived in Ecuador's eastern city of Puyo to witness the court hearing, which is expected to include several days of oral testimony from Waorani leaders, with a decision in the next few weeks. The Costa Rica based Inter-American Court of Human Rights also ruled in 2012 that Ecuador had violated its Sarayaku Amazonian community's right to prior consultation before drillers started exploration on their lands in the late 1990s.